Nosebleed in children are worrying. As a parent, it’s heartbreaking and you feel terribly upset. And not as worrying as it looks. As an ENT surgeon nosebleed are some of the most frequent emergencies we attend. The most important advice in cases involving children is rarely medicine. I felt a little info about first aid home care for nosebleed would be useful. Most often it’s due to nose picking. Nose picking is easily the most common reason for nosebleed in children. Luckily nosebleed in children are hardly ever life threatening. But just knowing the why is not good enough . Parents need to be aware of danger signs. The signs below show when you need to visit the emergency. Massive nosebleed , which doesn’t stop even after the home-care described below. You find nosebleed has made your child pale, tired or disoriented. Doctors will focus more on the child’s breathing and hemodynamic stability ,than the nosebleed. Identification of the site and cause of nosebleed, is of importance only after making the child stable. Temperature and humidity changes make the inside of your child’s nose become dry. WHAT COULD BE THE CAUSE OF FREQUENT NOSEBLEED IN CHILDREN? Children younger than two years rarely have nosebleed. Child abuse is another worrying cause of recurrent nosebleed in children. That’s a potential red flag for healthcare providers. 50% Adults with nose bleeding has the history of nosebleed during childhood. WHAT IS THE BEST WAY TO STOP A NOSEBLEED AT HOME? Make your child sit down and bend forward and pinch the soft part of their nose. Bending in front, helps to drain blood down the nose and prevents trickling to the back of the throat .Trickle to the back of throat can cause vomiting and more bleeding. You can apply antibiotic ointment, petroleum jelly,nasal drop. Nosebleed in children most commonly occurs from the front part of the nose. This is known as anterior epistaxis.If its not controlled at home you might need to visit, the emergency of your nearest hospital. In children – cautery should be used under GA. If bleeding not controlled by cautery. MEROCEL PACK: This is in between an Absorbable nasal pack and ribbon gauze.This is made of biocompatible , polyvinyl alcohol sponge material which helps to stop bleeding .It has a very high-capacity for absorption . Provides a mild pressure and tamponade effect after insertion in the nasal cavity .This tamponade effect helps to stop the bleeding. It may be kept for upto 5 days , but under antibiotic cover. Impregnated with antibiotic and vaseline. Blind packing aggravates bleeding ,as the friable mucosa is traumatized. Secondary sinusitis.Infection of the sinuses. Originate toward the back of the nasal passage, near the throat.Occurs mostly in elderly as hypertensive epistaxis. 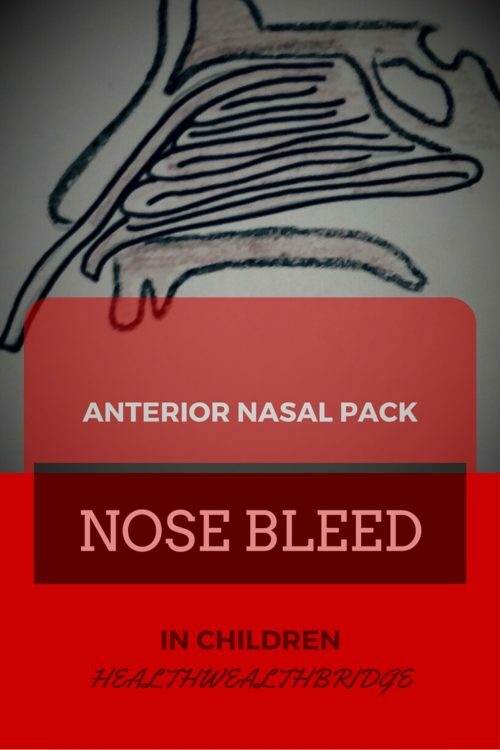 Posterior nosebleeds are less common than an anterior nosebleed. But they can be serious and can cause a lot of blood loss. Children do not usually get posterior nosebleeds. But if it does occur, they can be serious .Posterior epistaxis can cause significant blood loss and collapse. In children it can occur following trauma to nose. 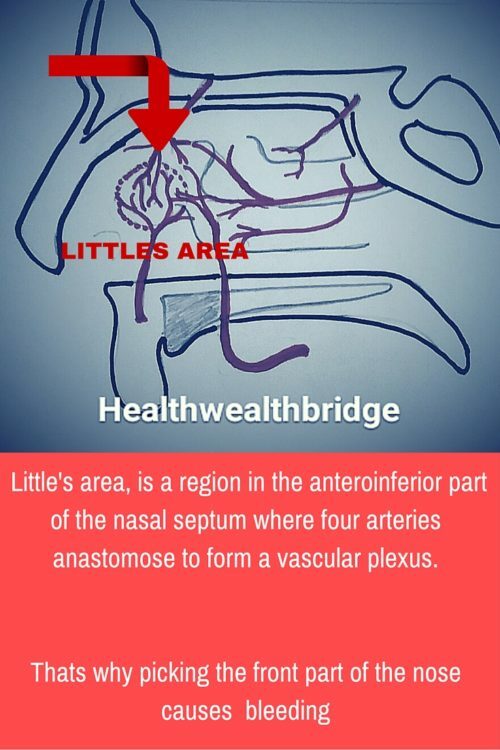 This causes the nasal bone to break and injury to the sphenopalatine artery .This sphenopalatine artery at the back of the nose can cause profuse bleeding.Thus is a serious emergency and needs urgent medical intervention. HOW CAN FREQUENT NOSEBLEED IN CHILDREN BE MANAGED? Consultation with your doctor is important in case of frequent nosebleed. Careful history: Generally there is the history of prolonged bleeding after minor trauma, teeth extraction etc. If your child gets nosebleeds frequently.After a full checkup if you find its due to nasal crusts and nosepicking. There are a few things which you can do to help stop nasal crusting. The less the crust, less will be the childs tendency to pick his/her nose. Use a humidifier in your bedroom while sleeping, especially when the air is very dry. Keep your child’s nose moist using a saline nasal spray. Teach your child to stop picking his/her nose, clip their fingernails to avoid injury. 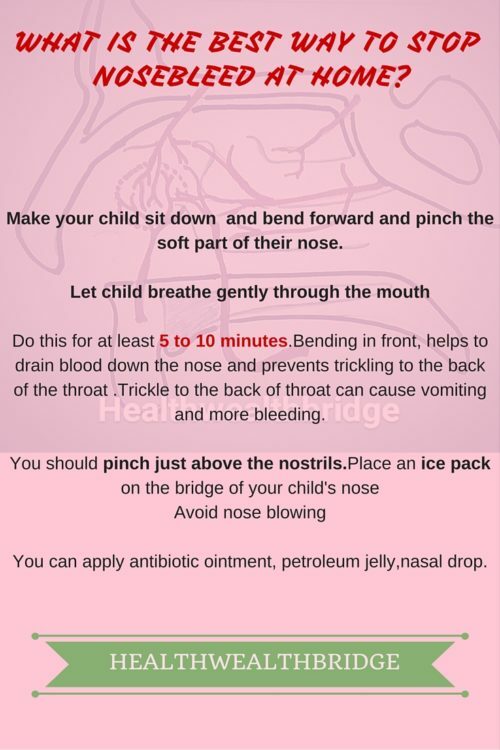 Explaining to your child about the possibility of a doctors visit ,with nose bleed may help them not to pick their nose. Please share and help another parent.They will thank you for this. The information provided here is strictly meant to help and educate.It is not a replacement for professional medical advice.In case of emergency ,always visit your nearest emergency healthcare facility . The prevention tips and 1st aid are very helpful. good and detailed post. Thanks Dunja.Glad ypu liked it. That’s so helpful….. as well as a handy information while at emergency – thanks for sharing it….. Yes Abhirup,that was my intention .Glad ypu found it useful. Yes Abhirup,that was my intention .Glad you found it useful. This is the appropriate website for anyone who needs to find out about this issue. that I actually would need… HaHa). You definitely set a brand new spin on a topic thats been written about for years. Valuable information that can save lives! Thank you for sharing this! These are really good tips for everyone to know! This is a really helpful checklist. I remember I often suffered from nose bleed when I was a kid.